DALLAS—Already one game up in the Western Conference Finals and within sight of the NBA title, the Dallas Mavericks confirmed Thursday they were not putting any special thought or effort into winning the championship for veteran point guard Jason Kidd. "Do you know, I haven't really thought about it like that at all," said Dallas forward Dirk Nowitzki, who tallied 48 points during his team’s Game 1 victory. "I mean, yeah, he's our point guard and I like him fine, but to win the championship for him, I don't know. Yeah, that just seems a little strange." 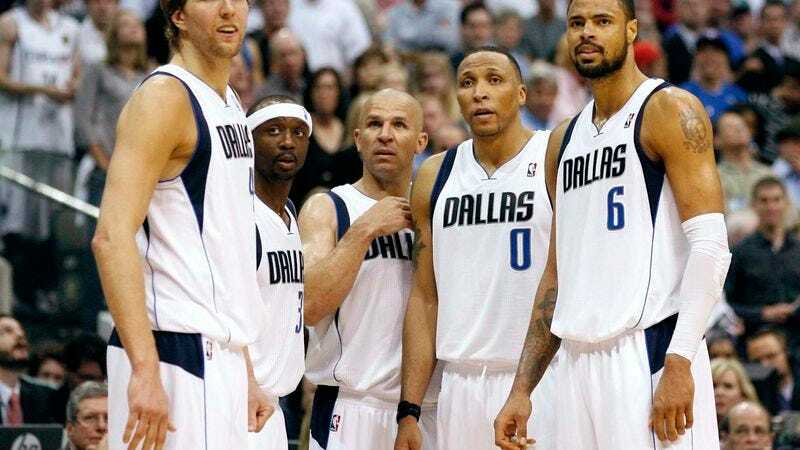 Nowitzki's teammates told reporters that at no point did the Dallas Mavericks ever get together as a team before or during the season and say they wanted to win an NBA title so that Jason Kidd could finally retire with a championship ring. In addition, team sources confirmed they weren’t feeling added pressure to beat the Oklahoma City Thunder as a result of this possibly being Kidd’s last chance at a title. According to Mavericks players, the phrase "Let's do this for Jason" hasn’t been uttered once this entire season, not in the locker room, during practice, or in any sort of game situation. "If you think of Jason as being a part of the whole team, then, yes, we're doing it for Jason," said Mavericks head coach Rick Carlisle. "I mean, just as much as we are for everyone else. Essentially, him winning a title is a nice side effect of us winning a title, I suppose. Are people saying that's what we're doing? That we're playing for Jason Kidd? Because we're not." When asked about being inspired to win by Kidd, dedicating a possible championship to Kidd, or whether anyone on the team had ever been heard to say "If anyone deserves this, it’s Jason Kidd” after a victory, Mavericks players, coaches, and staffers all reacted with bemusement. Responses to the idea of Kidd winning his first NBA title this year ranged from "It would be sort of nice" to "I've really only had about three conversations with him, total" to "Of course winning it for him is on everybody's mind, since Dirk has played his whole career here and we feel he's still somewhat underrated, so… Oh, you meant Jason Kidd! Why, no." "Jason was one of my favorite players when I was growing up," said backup point guard J.J. Barea, who has been invaluable to the Mavs when coming off the bench during the playoffs. "So playing behind him is an honor and so on. But still, it's not like the Knicks ever said, 'Hey, we have to win this one for John Starks.' I was kind of hoping we'd trade for Steve Nash at some point this year, actually." "It'd be awesome to help Steve Nash win a title,” he added. "Man, that guy really deserves it." In an informal team poll, Dallas center Tyson Chandler told reporters that Kidd was "about 85th on the list" of reasons why he would want to win the championship; shooting guard Jason Terry said that Kidd was "an okay guy, but not inspiration material," and six other players responded by saying, "Jason Kidd is perfectly fine, sure." "Can you imagine that?" Kidd added. "After all that guy’s been through with injuries and so on? I'd love to watch that." Outspoken Mavericks owner Mark Cuban, known for his colorful and controversial statements regarding his team, initially declined comment on the matter, but reluctantly agreed to do so when assured his remarks would not be construed as an endorsement of Kidd as an inspiration, a motivating figure, or a team icon. "Let's put it this way—if we don't win this, I'm not ever going to think, ‘We failed to get a championship ring for Jason Kidd,'" Cuban said. "I mean, I have absolutely nothing against him. Good guy, good player. But c’mon, it’s Jason Kidd, you know?" "Wait a second," Cuban added, "didn't he hit his wife?"